This is the time of year when I am happy that I canned all those tomatoes! Homemade tomato soup and a grilled cheese sandwich is a very satisfying and nutritious winder meal. And surprisingly, both the soup and the sandwich can be made in less than 30 minutes! You may also want some some shredded cheese and some baking soda... read on to learn why. If using, drain the stewed tomatoes into a colander. I like to add the stewed tomatoes to the soup to give it a variety of textures. If you want a thin liquid soup, leave them out. I canned these tomatoes in one pint jars but I use two jars for the soup. After draining off the liquid, there are only about 2 cups total of the tomatoes. Apparently I am not very good at packing my jars tight while canning. Add the butter and garlic to a medium sized pan. Saute the garlic until it is light brown and makes everyone in the house hungry. To the pan add two cups chicken or vegetable stock. If had had any homemade stock on hand I would have used that. Time to get a whole chicken! Also add the stewed tomatoes (if using) and all the tomato sauce. Stir and heat over medium heat for 10-15 minutes. While the soup cooks, make those grilled cheese sandwiches. No recipe provided...yet. After your 10-15 minutes of cooking time, the soup should be boiling lightly. Taste the soup. If it is too sour, sharp, acidic, or however you want to describe it, add a small pinch of baking soda to the soup and stir. It will bubble and fizz for a moment. The baking soda is neutralizing some of the acid in the tomatoes. Taste again. If still too acidic, add another pinch. I find I often add three small pinched (which is probably less than 1 teaspoon of baking soda). If you add too much baking soda the soup will taste really salty and flat and basically need to be tossed in the trash. So don't do that. Turn off the heat and add your dried basil and stir. Let the basil sit in the soup for a couple minutes before serving. If you have fresh basil chop it up fine and add as much as you can stand. Seriously fresh basil is awesome and healthy! My husband loves to add a clump of shredded cheddar cheese to the soup. I just dip my grilled cheese sandwich in the soup. Enjoy. Your soup looks so wonderful. And it's a perfect meal for a winter day. Hope you have a great day. can't wait to try this soup! Your soup looks great. I've got to try your recipe. My oldest loves tomato soup. Thanks for sharing at Turn it Up Tuesday. Angel, I am always surprised at how simple this recipe is. And I am also surprised at how excited my husband gets when I make it. Let me know how your oldest likes it! I've been experimenting with making tomato soup from the jars of tomatoes we put up in the summer--but I didn't know about the baking soda trick--thanks for that! 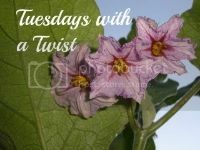 I'm delighted to follow you on Tasty Tuesdays! I am a dipper too :) And I don't seem to pack my jars full enough either. Guess we might be related? lol Thanks for linking to Snickerdoodle Sunday! Your tomato soup looks wonderful! I pinned it! Thanks for linking up at Saturday Dishes. Our temperatures are in record lows tonight so I could really go for a cup of hot tomato soup! Your soup looks delicious! Stopping by from Hit Me With Your Best Shot party. This looks so good! Thank you for sharing at This~N~That Thursday! That looks so good, and I'm so hungry right now! Thanks for linking up with the Bloggers Brags Pinterest Party. I have pinned your post to the Bloggers Brags Pinterest Board! This rich, savory tomato soup is just what I need on this cold wintry day! I can't wait to try it! Thank you for sharing this on the Healthy, Happy, Green & Natural hop! I appreciate it! Looks so good and would be perfect for this cold Winter weather!! Great post! Pinned to try later this week! 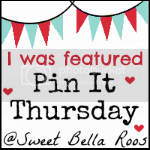 Thanks for linking up at Pin It Monday! =) Have a great weekend! I am a huge soup freak (hated it when I was a kid :)) This looks delish! YUM!!!! This is delicious. You've been featured @ Back to the Basics for Tuesdays with a Twist. Thank you for sharing! This looks delicious and so much healthier than the recipe I'm using now! I'll have to remember this in the summer when I am knee deep in tomatoes! 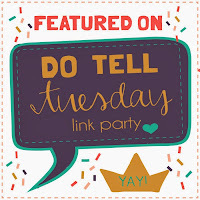 Thanks for sharing at the Hit Me With Your Best Shot Link Party last Tuesday! Hope to see you again tonight at 7EST! Excited to see what you've been up to! This is marvelously wonderful recipe! I am honored that you shared at Home and Garden Thursday!